The TruShield protectors are made of .33mm tempered glass that is 9H rated for hardness. This is the highest level of scratch resistance you can find in a tempered glass screen protector. It is also ultra clear so you don’t lose any of the vivid color of your display on your device and in some case it actually enhances it a bit. With dozens of models for mobile devices and tablets available, there is likely a TruShield protector available for your device and I have no hesitation in recommending them. 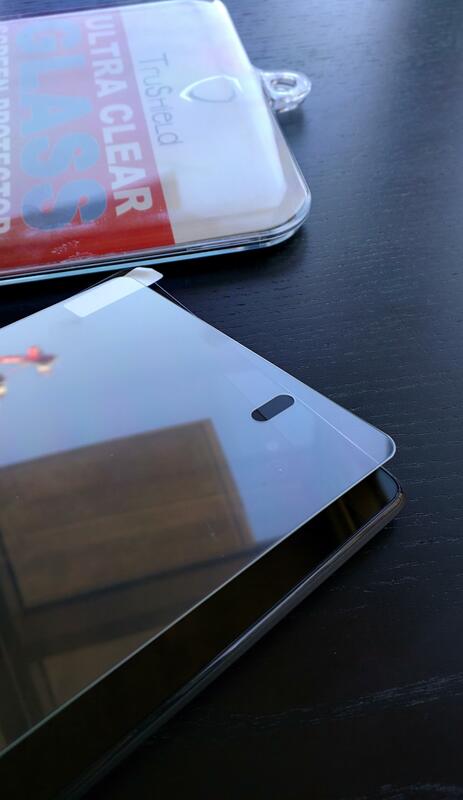 I will be the first to admit that I have never been a big fan of screen protectors. The film style protectors never seemed to offer much protection other than scratches (which with Gorilla Glass 3 now on most device, do you need this?) and I was forever struggling to keep them on or get them on without having the random air bubble in them. In fact up until this summer I had all but given up on them. That’s when my wife introduced me to TruShield. She had been using TruShield screen protectors on her iPhone 5S for over a year and swore by them for their protection of her screen for the occasional drop and of course scratches, dust and dirt. She also liked the fact that they did not fingerprint up as bad as the screen on her iPhone itself. I decided to try them out on my Nexus 6 and Nexus 7 to see what I thought. I’ve been more than impressed and pleased with the TruShield protectors for my devices. devices it is simply a matter of lining things up and dropping them into place. Once they are in place, you’ll never know that it is installed from a usability perspective. TruShield provides you all of the things you need to prepare your device to apply the protector including a small alcohol pad to clean your screen completely, a microfiber dust cloth and the protector itself all come in the kit. To apply the TruShield protector, I highly recommend you remove any cases on your devices and lay them flat on a table or counter. This will make it easier to install and likely to get the alignment right the first time. To start, use the alcohol pad to clean your devices screen. This will remove any oils that may be on the screen which can cause bubbling or a lack of adhesion. Once it is clean, use the microfiber cloth to clean off any residue and to have a perfectly clean surface to apply the protector. 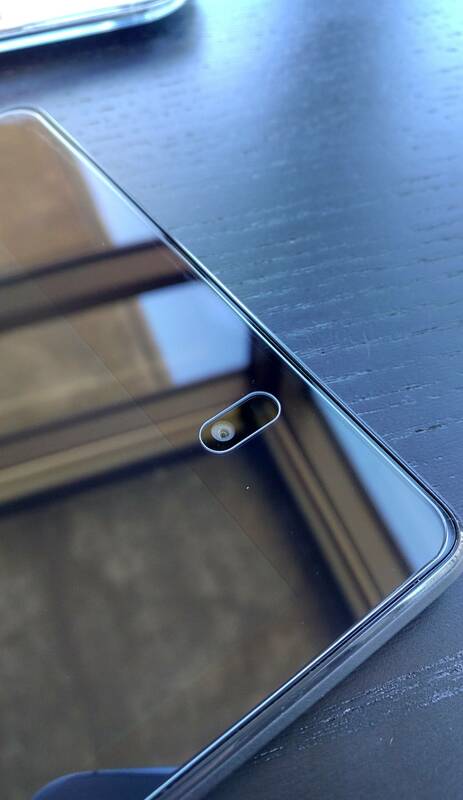 With the screen clean, take the glass protector itself and do a test run of lining up the protector on your device. Once you are satisfied with how to apply it, remove the plastic film on the back of the protector to expose the adhesive which will hold it on your device’s screen. The plastic film is easily removed by pulling on the paper tab at the top of the protector. Finally, line up the TruShield protector over your device, making sure you pay attention to speaker cut outs and camera cutouts in the glass. Once you have it lined up, drop the top edge of the protector onto your device then use your index finger to swipe down the middle of the protector to apply it evenly to the device. Doing this will instantly adhere it to your screen and you can watch as it slowly sticks to your device. Once it has settled down onto your phone or tablet’s screen, use the microfiber cloth again to rub down the edges or any bubbles that may have been trapped. Worst case if you need to re-apply the protector, you can do so. Gently pull up one end of the protector with a fingernail, making sure not to bend it (remember, it’s glass!) to peel it off and try the process again. If you have a device that has rounded displays like the Nexus 6 or Galaxy S6 Edge, you will note that the protectors are slightly smaller than the displays themselves. This is to assure they do not stay unattached at the edges where the rounding of the glass display happens. This can make application on these devices a bit tricky so take your time. It took me a couple of tries to get it right on my Nexus 6. Once the TruShield protector is in place, you will not really notice it. It is ultra clear and your touch screen works flawlessly through them. You clean them as you would the display itself which for me usually is a microfiber cloth. Because of the 9H hardness rating of the protectors, it is unlikely that you will ever scratch your TruShield protector. In fact the only time I have had to replace mine has been after I dropped my phone and the protector shattered but my display on my Nexus 6 was just fine underneath. While TruShield doesn’t guarantee such protection, it is nice seeing that the protector does the job of sacrificing itself for the display of the device. Overall I’ve been very pleased with the TruShield products I have purchased for my and my wife’s devices. 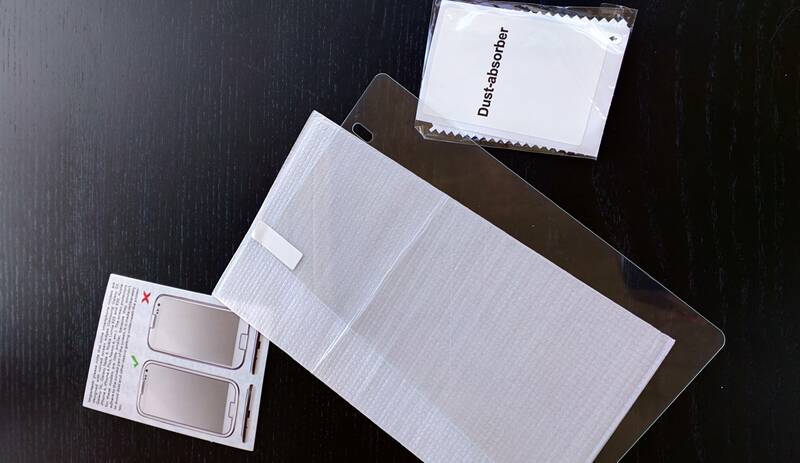 They are easy to apply, provide great protection for the device displays and because they are designed to be ultra clear, you’ll never really know it is on your screen. TruShield Tempered Glass screen protectors are available for a wide range of Android devices as well as Windows Phone and iPhones. They are available directly through Amazon.